Chromecast is one of the most brilliant inventions of our time. It helps us stream whatever we want to on the big screen without batting an eye. This didn’t even seem possible a few years ago, and here we are! It looks like a USB and comes loaded with enticing features. What’s more, it is also portable and convenient. The key here, though, is to learn its many features and their functions one after the other. A few functionalities may not be obvious in the beginning but figuring them out will help you use your powerful device to the fullest. 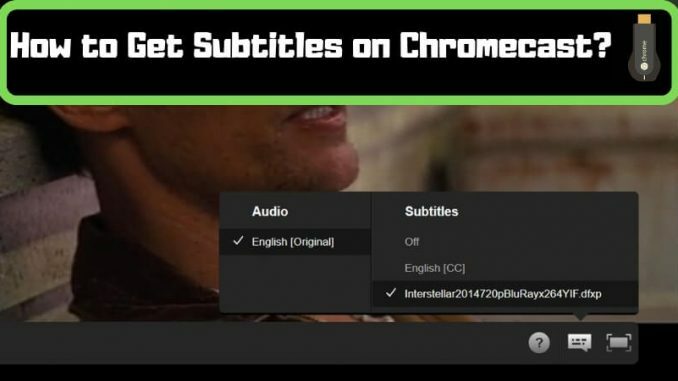 How to Get Subtitles on Chromecast? One of the most popular doubts that we hear is how to activate subtitles on Chromecast. And, in this article, we are going to solve this for you! The process varies based on the type of operating system, which is why we are talking about each individually. Select any video that you are sure has subtitles. Open the Chromecast controls by pressing the Chromecast control bar. You will see a CC button on the screen. It is usually on the left side at the bottom. Press the CC button and then press English. If there’s any other language that you prefer in the list, choose that. Videos with subtitles usually have a .smi or .srt file. This is the file that contains the subtitles. Remember that .zip may not work. So if you have the file in .zip, you will need to scrap it and download the appropriate file. Play the movie or video. On the top right you will see an option that is showcased through three dots, select it. Here, tap on Add Subtitles. Choose English subtitles or subtitles in any other language that you prefer in the available list. Isn’t that easy? It is just a few minutes’ worths of work and does not need you to sweat it either! So, go on and activate subtitles in your Chromecast and watch video from across the globe! If you would like us to help you further, please feel free to let us know in the Comments section.